There are two new lightweight strollers in Chicco collection. Chicco Mini Bravo and its more advanced version – Chicco Mini Bravo Plus are are designed for quick trips around the city, travels and going to amusement parks. Both strollers weighs less than 20 lbs which makes them easy to lift to the trunk or carry up and down the stairs. Little weight doesn’t mean less functionality though! These two models have many great and useful features including: deep recline, good-sized canopy with ventilation, quick self-standing fold and included parent tray. There are however few differences between these two strollers. 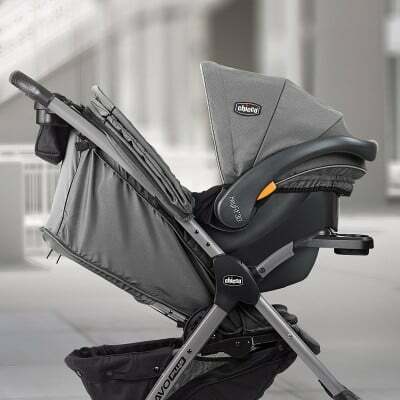 The main difference is that Chicco Mini Bravo Plus is better equipped: it comes with child tray and features compatibility with infant car seats which means it can be used from birth as a travel system. Because of this few differences, this more advanced model is more expensive as well. But don’t worry! Both Chicco Mini Bravo and Chicco Mini Bravo Plus are great choice for parents on a small budget, since they cost less than $200. Parent tray & big storage basket – included! Large storage basket + TWO trays included! 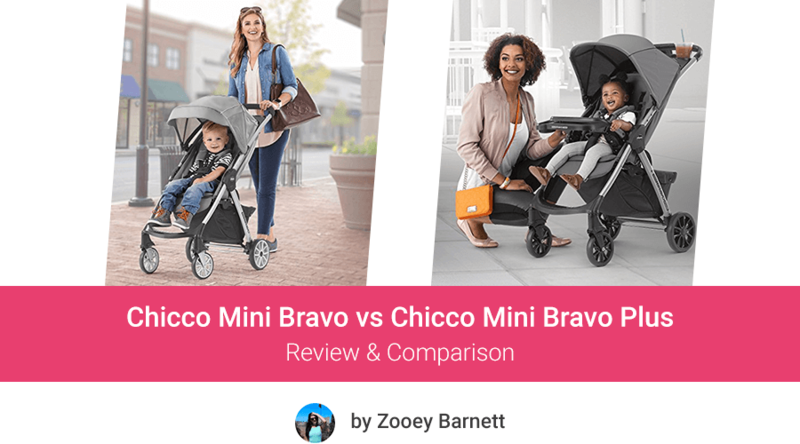 What other parents think about Chicco Mini Bravo and Chicco Mini Bravo Plus? Let’s take a closer look at functions and features of Chicco Mini Bravo and Chicco Mini Bravo Plus. Find out which one of them would suit you better. Chicco Mini Bravo and Chicco Mini Bravo Plus are equipped with a seat suitable from 6 months. The weight capacity for each seat is 50 lbs. As for the dimensions, both seat are the same, with 25 inches from the bottom of the seat to the top of the canopy. 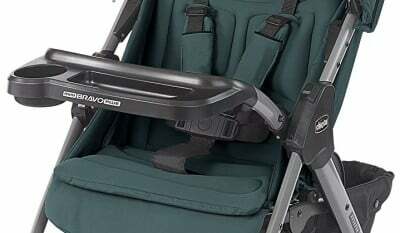 The backrest on Chicco Mini Bravo and Chicco Mini Bravo Plus offers 3 positions. The lowest position is not completely flat (it’s about 30 degrees from horizontal) which means it’s not newborn-ready. But the lowest reclining position should be sufficient for comfortable nap on the go. 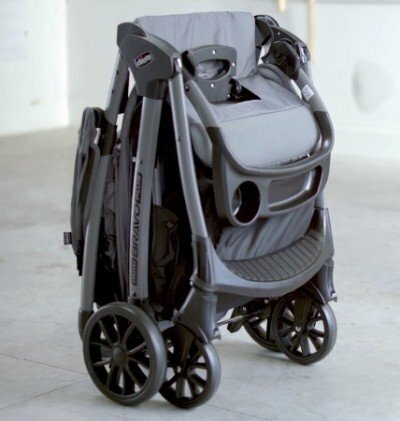 Both strollers feature the same reclining mechanism – you can easily lower and raise the backrest with one hand! What I really like about the recline is that it’s one-handed. You can easily lower and raise the backrest by squeezing a lever. No more struggling with straps and buckles (which always require using two hands), with these two strollers reclining is a piece of cake! I also love the most upright position – it’s pretty straight – which is quite a rare thing among strollers. Thanks to it your curious toddler will be able to sit more upright and observe surroundings. 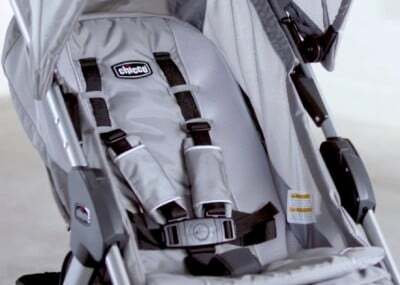 Moreover, each stroller has adjustable 5-point harness with padded shoulder straps and crotch strap. However there is one big difference between both seats: each is made of a different fabric and has different padding. Chicco Mini Bravo has more thin fabric and padding. Both sides of the seat are made of mesh to provide extra ventilation for the baby. On the other hand, Chicco Mini Bravo Plus has more thick fabric and deep, rich padding. Although there is no mesh (no extra air-flow) I definitely prefer this fabric as it’s softer and nicer to the touch. Each stroller has padded calf rest and separate footrest for older passengers – both are non-adjustable. This is the main difference between Chicco Mini Bravo and Chicco Mini Bravo Plus. The former one doesn’t accepts infant car seats, while the latter one is compatible for example with KeyFit30 car seat (check this infant car seat). 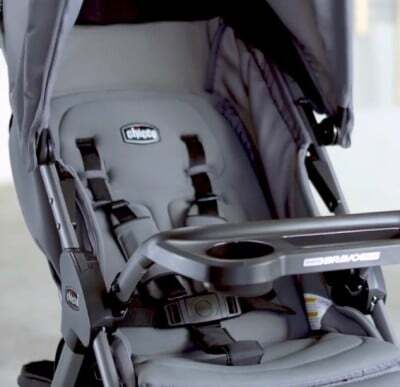 The child tray serves for attaching the infant car seat onto the Chicco Mini Bravo Plus. You won’t need any other attachments or accessories. Just attach the child tray, click-in the car seat and you’re ready to go! 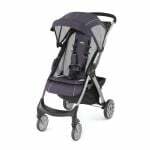 Chicco Mini Bravo Plus travel system is suitable for newborn babies. Chicco Mini Bravo doesn’t offer infant car seat compatibility therefore it can be used only from 6 months when the baby can sit upright unassisted on the main seat. The canopies differ in few ways. Chicco Mini Bravo has 2-panel sunshade with flip out sun visor. This canopy has vented sides (made of mesh) for additional air circulation. Unfortunately there is no peek-a-boo window and the fabric doesn’t have SPF. 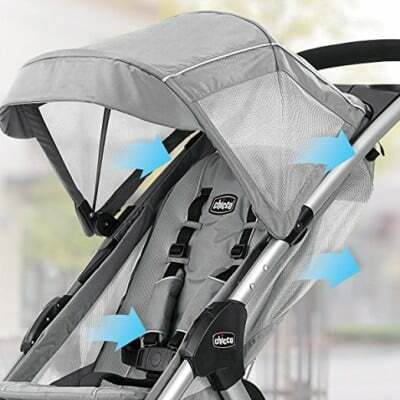 Chicco Mini Bravo Plus has 2-panel canopy as well, but you extend it to provide even more shade for the baby by using the zip open third panel. It’s made of mesh so it allows air to circulate through. Moreover it can serve you as a peek-a-boo window (since there is no real one) as you can easily see your baby through it. 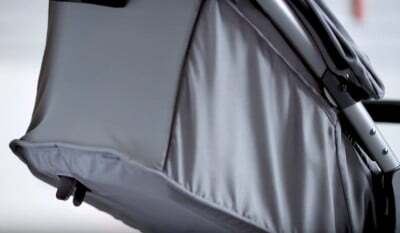 This canopy doesn’t offer sun visor, but when it’s fully extended it’s much longer than Chicco Mini Bravo canopy and it almost touches the child tray! Therefore it not only blocks the sun out of baby’s eyes, but even cover his torso. 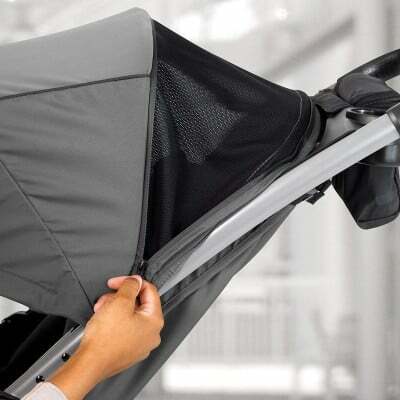 Not every lightweight stroller offer such a generous sunshade so it’s a BIG PLUS. Both Chicco Mini Bravo and Chicco Mini Bravo Plus have non-adjustable handlebar, each set at 41.5″ from the ground. The height is great for average and tall parents (above 5’5″). It may be too high for a short person and cause wrist pain. There is however a big difference between these two push bars. Chicco Mini Bravo handlebar is covered with foam which of course is prone to tearing. I’m not a fan of it. I definitely prefer the handlebar on Chicco Mini Bravo Plus which is more luxurious and has textured rubberized grip. So here you don’t have to worry about ripped foam cover. This handlebar will sit really well in the palm of your hand making the pushing more easy and convenient. 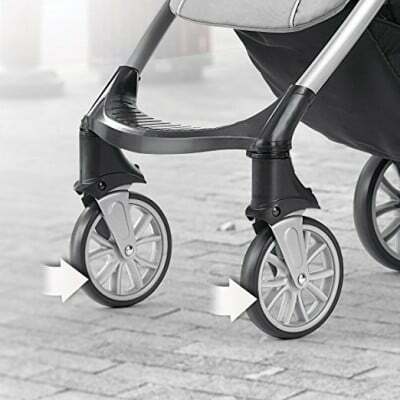 Both stroller have the same wheels: 8″ in the back and 6.25″ in the front. They are made of EVA foam. 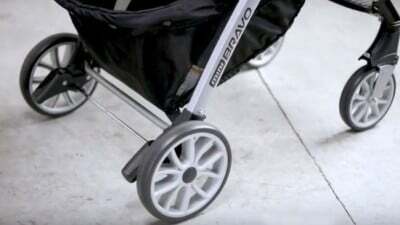 Front wheels swivel a full 360 degree which makes the stroller more maneuverable and easy to steer and turn in tight places. These wheels are designed mainly for flat terrain and they work best on even sidewalks, pavement, bricks and hard-packed dirt roads. I wouldn’t recommend taking these strollers on any bumpy road (like gravel or tall grass) as it will bounce and wiggle. Both Chicco Mini Bravo and Chicco Mini Bravo Plus are designed for city use so they are not suitable for off-road trails (the riding comfort would be decreased and the baby wouldn’t be protected from the negative effect of bumps). Both strollers have two brake pedals, one for locking each rear wheel. So when you stop and want to lock the stroller in place you need to press each pedal separately to engage the brakes fully. Pushing and lifting the pedals is quite easy but it may be less convenient in open-toed shoes. This is the feature that I love about both model. Chicco Mini Bravo and Chicco Mini Bravo Plus have AWESOME, OVERSIZED storage baskets. Each bin can easily accommodate large diaper bag and there still be a spare room for a blanket, grocery bag, your purse or jacket. Not every lightweight stroller has so spacious basket so it’s a really big advantage of Chicco Mini Bravo and Chicco Mini Bravo Plus. Moreover each basket is very easily accessible from the back, even when the seat is fully reclined. Love it! 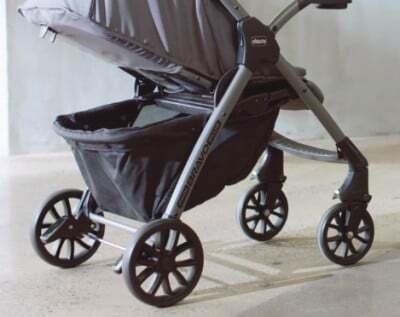 Both strollers have the same dimensions and are quite small, which makes them perfect for shopping at the mall or going through crowded sidewalks. Each one is only 20.8″ wide so you won’t have problems with fitting through doorways, elevators, narrow aisles in grocery stores or going through crowded Disneyland. Chicco Mini Bravo and Chicco Mini Bravo Plus differ in weight a bit. The former one weighs 18.5 lbs while the latter one weighs 19.6 lbs. The difference is not big and both stroller are very portable. They are easy to lift to the car trunk and carry up and down the stairs, especially since they have convenient carry handle (the same one which you use for folding). 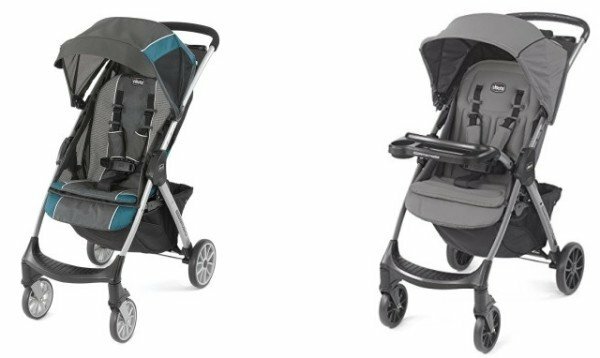 Both these lightweight strollers are very easy and quick to fold, just like other Chicco strollers. You just need to pull the handle which is hidden in the middle of the seat and the stroller will collapse in half. 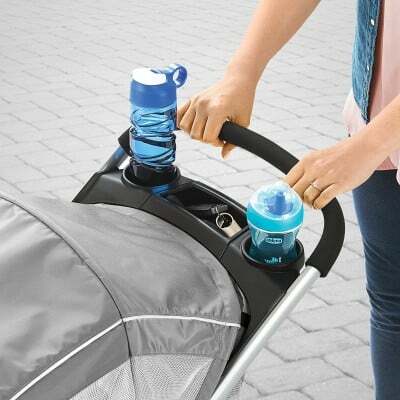 You can also use this handle for carrying the stroller around. I really like that folding can be done with one hand and that the stroller features self-stand. It makes transporting and storing more easy. Both Chicco Mini Bravo Plus and Chicco Mini Bravo have quite compact fold. The dimensions are the same for both models (if you take off the child tray of the Mini Bravo Plus): 28.3″ x 20.8″ x 14″. You shouldn’t have problems with storing them at home or fitting them in the car trunk (even a small one). I only wish the strollers folded inwards, so the seat fabric was not exposed to dirt so much. You need to be careful when you transport these strollers in a trunk so the seat won’t get dirty or ripped. Mini Bravo and Mini Bravo Plus come with a useful parent tray that offers two cup holders and one storage compartment for parent valuables like keys and cell phone. On the Chicco Mini Bravo the storage compartment is open, while the Chicco Mini Bravo Plus pouch closes with a zipper. It’s quite deep so your cellphone will definitely fit there and you can put there other small items that you prefer to be hidden. Moreover Mini Bravo Plus comes with a child tray which has one cup holder and one snack holder. 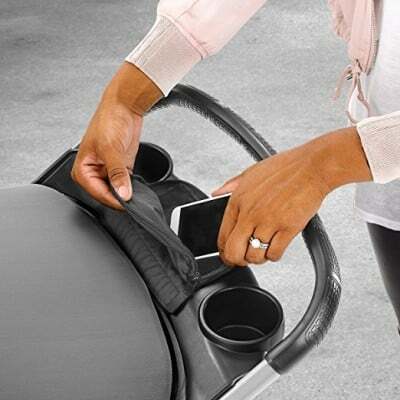 This tray also doubles as a click-in attachment for infant car seats. 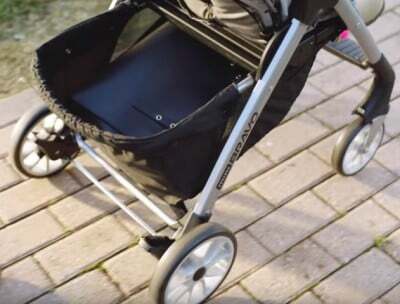 Besides, you don’t have to remove this tray, it folds with the stroller! I love that this stroller comes with these two accessories and you don’t have to pay extra for them. To sum up my review I put all of the differences between those two strollers in the table below. If you’re wondering which model is better and which one you should choose this comparison should help you. 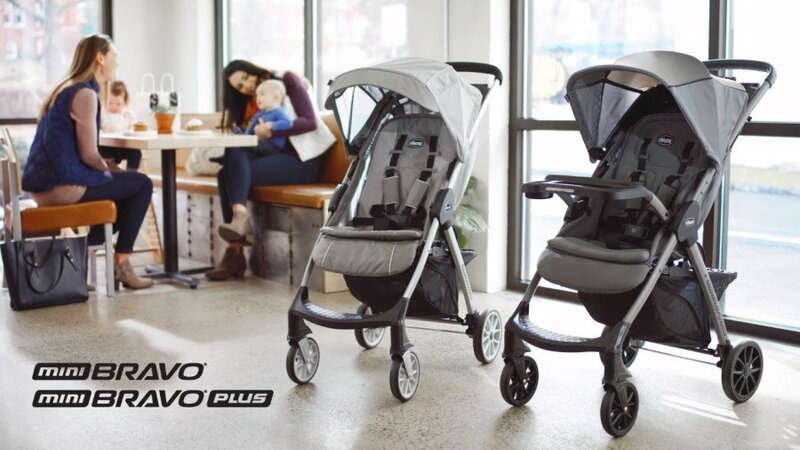 Check the table below and find out which stroller suits you and your child better: Chicco Mini Bravo or Chicco Mini Bravo Plus? 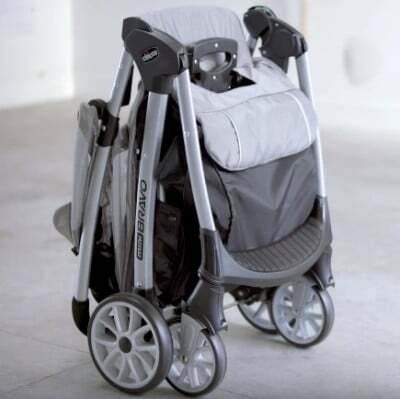 Apart from these differences both strollers have similar features: small EVA foam wheels, two brake pedals operated by foot, 3-position recline, adjustable 5-point harness, non-adjustable footrest and calf rest and huge storage basket. Size, folding and folded dimensions are also the same for both strollers. Chicco Mini Bravo or Chicco Mini Bravo Plus – which one will work better for you? So if you’re hesitating whether to buy Chicco Mini Bravo or Chicco Mini Bravo Plus, here is my recommendation. 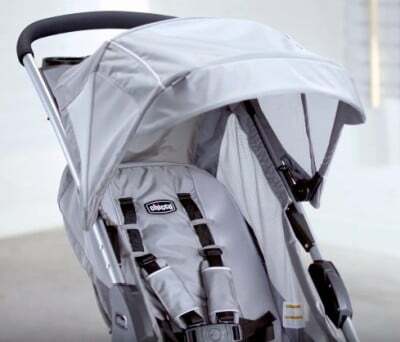 If you’re looking for a lightweight stroller that accepts infant car seats (which means it be used from birth), has big canopy that offers large amount of shade for the baby and comes not only with parent tray, but also child tray, you should go for the Chicco Mini Bravo Plus. But if you have smaller budget and need only a lightweight stroller (perhaps a second stroller), for a baby who can already sit upright and hold his head up, mainly for city use, short walks, running errands and going to the mall, you should choose the Chicco Mini Bravo. In the tables below you can find the most important assets and flaws of both strollers. When I’m writing this review both stroller are quite new on the market (they hit the stores at the beginning of 2018). Last time I checked them on Amazon they didn’t have many reviews yet, but most of them were positive. 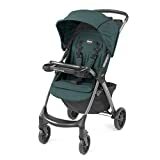 I’m sure both these lightweight strollers will become more popular soon (as other Chicco strollers) so I will update this section when there are more customer reviews. Below I gathered the most important information that parents mention most often in the customer reviews. The biggest advantage of the Chicco Mini Bravo Plus is the possibility to click in the infant car seat. Moreover the recline is comfortable for napping, the canopy covers the baby from the sun really well and the parent and child trays are very useful. 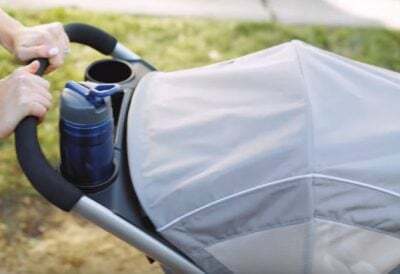 This stroller offers the same functionality as standard full-sized strollers, but it’s lighter, easier to fold down even for a petite person (read this review for example) and carry. 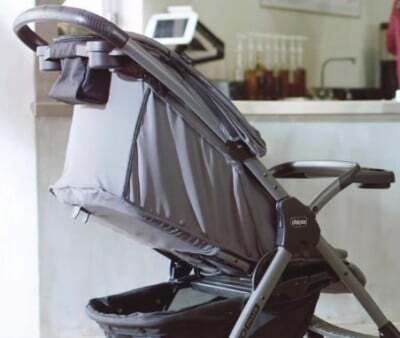 Moreover, according to parents the fabrics are soft and good-quality and the whole stroller is very user-friendly. It maneuvers easily both indoors and outdoors – some parents have been using it even on sand and wood chips (find out more)! Another assets are: large basket that can accommodate all parents essential, upright position of the seat, sturdiness of the whole stroller (read more in this customer review) and very easy assembly. The only issue that one parent mention is that one part got broken during shipping. Other parents don’t mention any disadvantages at all (at least at the time I’m writing this). When it comes to Chicco Mini Bravo parents praise it mostly for quick and truly one-hand folding and compact self-stand. Easy and fast packing for transport is very important for many parents (more in this review). Another advantages are: easy one-hand recline, padded seat and harness straps, easy to clean fabrics (read more here) good quality and lightweight construction (lifting it with a fold/carry handle is very simple). Huge storage basket and handy parent tray are another things that parents love about this stroller. They also mention it works great for indoor use (shopping mall, grocery stores) and on pavement. Additional sun visor and mesh sides of the canopy are very useful on hot days. The are some small drawback that parents mention: the lack of cover for the storage compartment on the parent tray, no child tray and no peek-a-boo window. 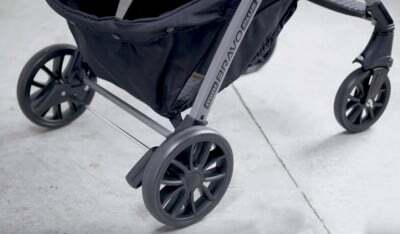 Moreover, one parent doesn’t recommend this stroller for bumpy surfaces (find out more). Chicco Mini Bravo offers 4 color versions: Stone, Mulberry, Chili and Pewter. You can see them in the picture below. On the other hand we have the Chicco Mini Bravo Plus which comes in 3 colors: Graphite, Eucalyptus and Storm. Check them below. Notice that some of the color versions may not be always available. If you want to check which colors of Chicco Mini Bravo are currently for sale click here, if you’re curious which color versions of Chicco Mini Bravo Plus are available click here. Both models are designed for city use and rather flat or slightly uneven terrain. They work worse on bigger bumps and cracks. The main seat is suitable only for kids who can sit straight unassisted (about 6 months old). Additionally, Chicco Mini Bravo Plus can be used from birth, but only if you add an infant car seat. 1. Both strollers cost less than $200 so are great option for parents on a small budget. 2. Good-quality, durability and sturdiness – these are the main advantages of both model. 3. Although Chicco Mini Bravo and Chicco Mini Bravo Plus are lightweight strollers, they are very well equipped and have many useful functions, just like standard full-sized strollers. 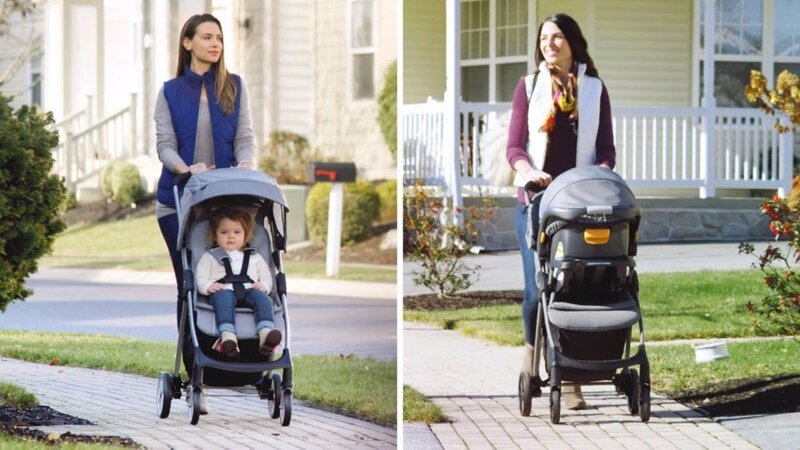 Are you thinking about buying one of these strollers? Don’t forget to check available discounts before you make your purchase. 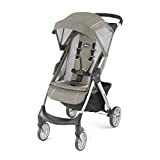 If none of these lightweight strollers meet your needs, you may want to check my list of other great light strollers for parents who are often on the go or travel with their baby.